Survivors of the Magdalene Laundries gathered outside the Dáil yesterday calling for a truth commission into ALL homes around the country. Protesters outside the Dáil yesterday calling for a truth commission into Magdalene Laundries. You weren’t allowed touch your own flesh and blood. FOR SHEILA O’BYRNE, the memories of being in St Patrick’s Magdalene Laundry on the Navan Road will always be with her. Though it has been almost 39 years, she said she still wants the truth. 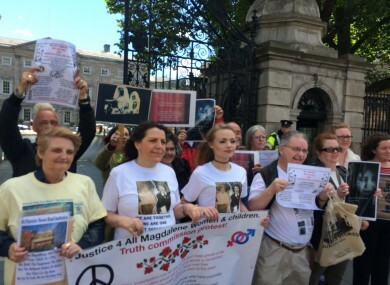 Survivors of the Magdalene Laundries gathered outside the Dáil yesterday calling for a truth commission to be established into all homes that were operating around the country. O’Byrne said women are still searching for their lost children, while others just want to know where their children, or their mothers who were in the homes are buried. It’s understood that at least 1,663 former Magdalene women are buried in Irish cemeteries – many in unmarked graves. In 2013, Taoiseach Enda Kenny apologised to Magdalene women in an emotional speech, saying the laundries “have cast a long shadow over Irish life”. However, the women standing outside the gates of Leinster House yesterday said more needs to be done to shine a light on what is one of Ireland’s darkest and most guarded secrets, they said. “It is a memory that will never leave me,” said O’Byrne. You were treated like dirt there. ‘You’ll pay for you penance’ – that is what they used to shout at me. My child was taken a couple of weeks after the birth. And you weren’t allowed touch your own baby – that was forbidden. You weren’t allowed touch your own flesh and blood. O’Byrne said it is time for all of the facts to be put out in the open, demanding that the State agencies, the clergy, the medical profession and the gardaí must be upfront about the roles they played. Recounting some difficult memories, O’Byrne said there were women and girls from all walks of life at the home she stayed in. There was a 12-year-old there when I was there, only a child, expecting twins. I got out before her but I discovered after that the little one had died. When you think of it, that was a child that had been interfered with – but nothing was done about it, it was all kept quiet. O’Byrne’s baby was put up for adoption. But after many years of searching, they are now in correspondence with one another. “I just wanted to know whether my child was dead or alive. It took nearly 40 years for a door to open for me. I want it all out now, all of it,” she said. “All we want is the truth,” added Catherine Coffey, who was in the Bessborough mother and baby home. “There are people here who have family members buried and they don’t even know where they are,” she added. The organisers of yesterday’s events, Mary Collins and her daughter Laura Stewart, travelled from the UK, where they live, to protest outside Leinster House. Mary’s mother, Angelina Collins, died at a Magdalene laundry. As an unmarried Traveller woman, she was put into a Magdalene laundry, while Collins was put into an industrial school. Collins visited her mother from the age of seven but said she didn’t realise until she was an adult the true extent of what her mother had gone through while at the laundry. Both Stewart and her mother say that the government should look at the Magdalene laundries, mother-and-baby homes and industrial schools together, as they believe they were all connected. “They are wasting more money opening commissions when what you have to do is look at these things as a whole,” said Stewart. Pressure has been mounting on the Children’s Minister Katherine Zappone to extend the Mother and Baby Home Commission’s scope to other homes. Last week, the minister appointed an expert forensic archaeology team to examine whether the Tuam mother and baby site can be excavated. She also confirmed that she has requested UN special rappoteur for the promotion of truth and justice Pablo de Greiff to examine whether a truth and reconciliation review of what happened should be set up. Email “'You weren't allowed touch your own baby - your own flesh and blood'”. Feedback on “'You weren't allowed touch your own baby - your own flesh and blood'”.